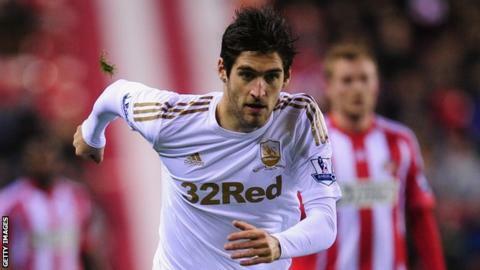 Sunderland manager Martin O'Neill believes new striker Danny Graham will score goals and win over supporters. Graham, 27, made a £5m move from Swansea on Thursday but his boyhood affiliation to Newcastle has not proved popular with everyone on Wearside. He was booed by some Sunderland fans in Swansea's 0-0 draw at the Stadium of Light on Tuesday, but O'Neill thinks Graham will prove his critics wrong. "He wants to do well and he wants to go and prove himself," said O'Neill. Figures are Premier League games in 2012-13. Danny Graham's figures are while at Swansea. "The fact that reaction the other evening didn't put him off coming here says something about the lad. "I think he has felt the need to prove himself during his career, that's probably what has kept him going. "He has got some experience as he scored goals last season and I think he wants to prove a point. All those attributes, I find pretty nice." Graham, who scored 15 goals in 54 league appearances for Swansea, will go straight into the squad for Sunderland's Premier League trip away at Reading tomorrow. It is not sure whether Graham will form a partnership with leading scorer Steven Fletcher, who has operated as a lone striker, with Stephane Sessegnon providing the support. O'Neill referred to Scotland international Fletcher, who has scored 10 goals this season since moving from Wolves in August, as another recent arrival at the Stadium of Light who has settled in well. "Steven Fletcher has come in and he might not have been everyone's choice but he's settled down and has been terrific for us," added O'Neill. "We have got a number of people here who have grown up either Middlesbrough fans or Newcastle fans. Lee Cattermole may never have considered himself ever playing for Sunderland at some stage or another, but it can happen."